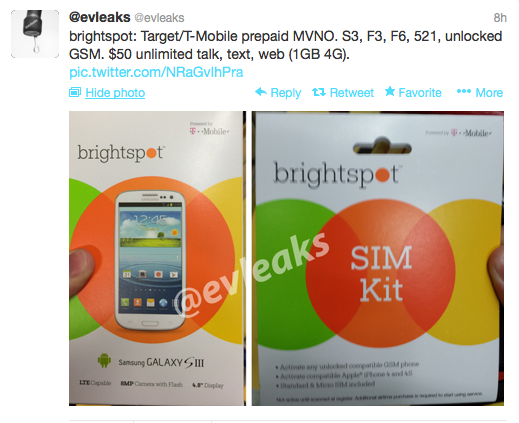 Other device expected to arrive with brightspot include the LG Optimus F3, LG Optimus F6 and Lumia 521. 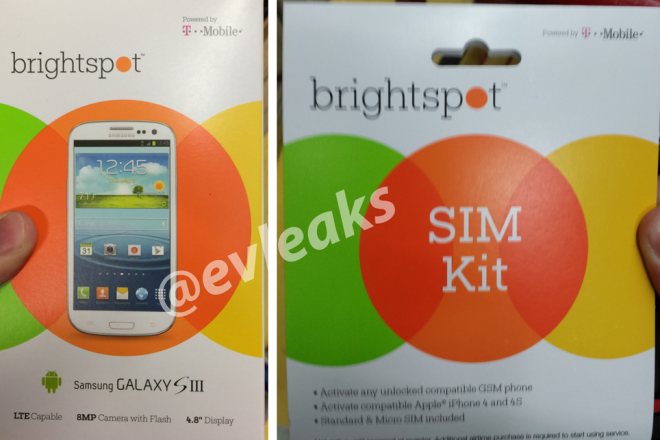 No word from T-Mobile or Target on any official announcement but the leak itself might mean news will be on the way rather soon. Good job ….t mobile can sell its inventory . I recently purchased the F6 and it’s much smoother and faster in transitions compared to the older l9. I definitely recommend that you purchase a F6. Why would you do either when you can get unlimited text and data with 100 minutes for $30 at Walmart, on T-Mobile? It’s only 5GB at 4G, for the Walmart one, but I’d definitely say it’s the better deal, though I can see some wanting more talk time. Definitely, but just to be clear that one only gives you 2.5GB 3G data, before throttled, if you’re talking about the family mobile plan. Clearly, you did since you felt the need to comment. Now, your comment is a reflection of your name. T-Mobile needs to offer unlimited talk and text and 5gb of 4G data for 50$.1GB and 2.5GB just does not get it for most consumers . Not trying to be rude but that’s pretty dumb remark. As if any network would do that. But anyway you can get unlimited talk and text with 3 GB of 4G on a T-Mobile MVNO called Simple Mobile and 5 GB for 60. Why they offer a 30$ 5gb with 100 minutes and unlimited texts at wal mart. 20$ more for unlimited talk would be fair. Wouldn’t that canibalize their postpaid plans? $50 for unlimited talk/text/data (500MB @ 4G), then $60 for unlimited talk/text/data (2.5GB @ 4G), and then of course the truly unlimited everything plan for $70. Would this possibly be where the trade-ins will go? Why can’t they have 4G for the full speed data then drop to 3G speeds. At least then you could actually use your phone instead of not being able to do anything. I can’t even use my phone when i am on 2g. Sadly they have a lot of broken connections out in edge territory, and if you are talking about throttled speeds, totally. They are actually using the very low end definition of 2G, where the high end is 384Kbps, which is quite useable, from my experience in Europe. Pulled down and uploaded over 2GB in less than 30 days on my phone. T-Mobile there. Kind of interesting. Of course that would depend. At my Target the electronics section is at the front, and I get at least 2 bars HSPA+, but definitely could have been easily the back section where it is the same sitch as your Walmart experience. David,unless I read wrong you can just buy the phone you don’t have buy the sim card kit with the phone. If so that is great. I wonder how much these phone will go for,will they be new or use? If T-Mobile would change their current $30 plan offered by wal-mart to have a few more mins, it would be killer. Say about 500 mins, unlimited text, with 5GB of data…woohoo. That would be so nice. I think an extra 400 minutes for $30 is a bit of stretch. Maybe 200-250 for that price. But if they had a $50/mo 5GB 500 minutes plan, I think that would be pretty attractive to a lot of people. i think it’s rather expensive. MetroPCS has the similar deal for 40. This 1gb should go for $35. Strange how no Tmobile MVNO’s offer short code support! I gave up though on these prepaid deals Straightalk and there new supposed lte sims on AT&T was the last straw. Was pathetic like slow Sprint. Im even gonna dispute the charge. Converted to Iphone 5C got good deal with AT&T contract which I get some work discount off plan too. I really think the postpaid people get better service all around. I would have would have went with Tmobile but they wanted 100.00 deposit and half the price down on device. Prob because I had owed them. 100.00 down I might have done but not half the device price too. Anyway ya no short code support right off the bat is a big NO for me.